I did not see anything in the Ghanaian media during my time there last week about the recent introduction of two breadfruit varieties to the country, though it has made the Samoan media recently (as well as late last year). But I did see the seedlings in the Bunso nursery of the Council for Scientific and Industrial Research. And very nice they looked too, ready for distribution to interested farmers to supplement the limited diversity they currently manage. Huge potential in this crop. This shows the plants at about 5 months of age. The story is available to some extent by googling “Samoan breadfruit in Ghana” for reports in the Samoan and Fijian press. We didn’t actually make any press releases in Ghana as we wanted to to keep it all a little quiet so as to avoid night watchman costs, etc. Field planting begins in the first week of April. Hoorah! 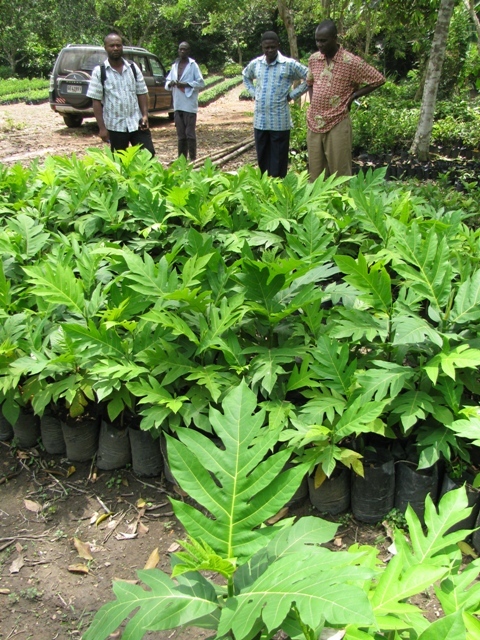 The first new variety breadfruit to reach West Africa since the 1840s. 500 kg/tree/year! 50 mt/ha! I would like to purchase a few Bread Fruit trees, please give me the phone# or any information I need to get a Bread Fruit tree here in Accra Ghana…Thank you very much. Please contact the Global Breadfruit website. Someone will follow up with you. I’m trying to get some seedlings to plant at Dormaa Ahenkro. Where can I get them from? Is there a phone no you can provide?